New York Times BestsellerA deadly bombing takes Navajo Tribal cops Bernadette Manuelito, Jim Chee, and their mentor, the legendary Lieutenant Joe Leaphorn, back into the past to find a vengeful killer in this riveting Southwestern mystery from the bestselling author of Spider Womans Daughter and Rock with Wings.When a car bomb kills a young man in the Shiprock High School parking lot, Officer Bern… adette Manuelito discovers that the intended victim was a mediator for a multi-million-dollar development planned at the Grand Canyon. But what seems like an act of ecoterrorism turns out to be something far more nefarious and complex. Piecing together the clues, Bernadette and her husband, Sergeant Jim Chee, uncover a scheme to disrupt the negotiations and inflame tensions between the Hopi and Dine tribes. Retired Lieutenant Joe Leaphorn has seen just about everything in his long career. As the tribal polices investigation unfolds, he begins to suspect that the bombing may be linked to a cold case he handled years ago. As he, Bernadette, and Chee carefully pull away the layers behind the crime, they make a disturbing discovery: a meticulous and very patient killer with a long-simmering plan of revenge. 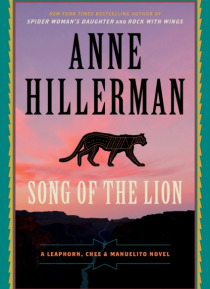 Writing with a clarity and grace that is all her own, Anne Hillerman depicts the beauty and mystery of Navajo Country and the rituals, myths, and customs of its people in a mystery that builds on and complements the beloved, bestselling mysteries of her acclaimed father, Tony Hillerman.